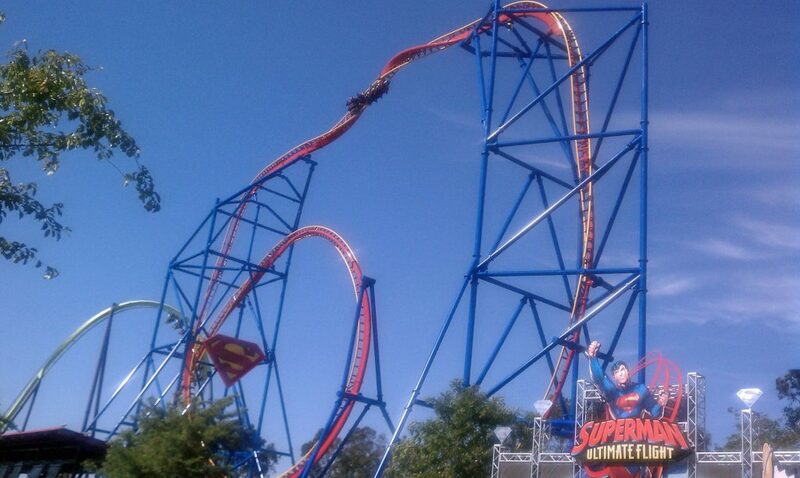 Superman Ultimate Flight at Six Flags Discovery Kingdom in California, USA. 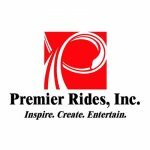 Premier Rides was established in 1994 in Maryland, USA. 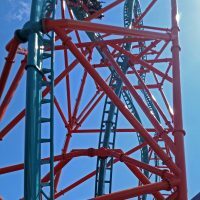 Premier Rides design and manufacture roller coasters, water rides, as well as drop, tilt and observation towers. 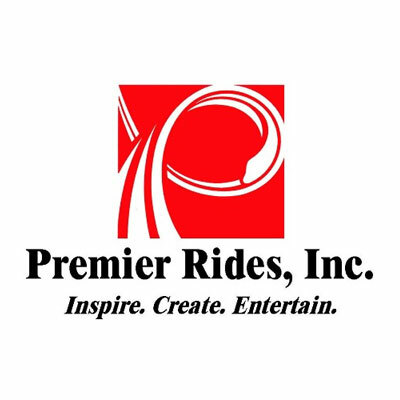 Premier Rides were the first company to use electromagnetic Linear Induction Motors (LIM) launches on their roller coasters and their installations are predominantly found in the USA. 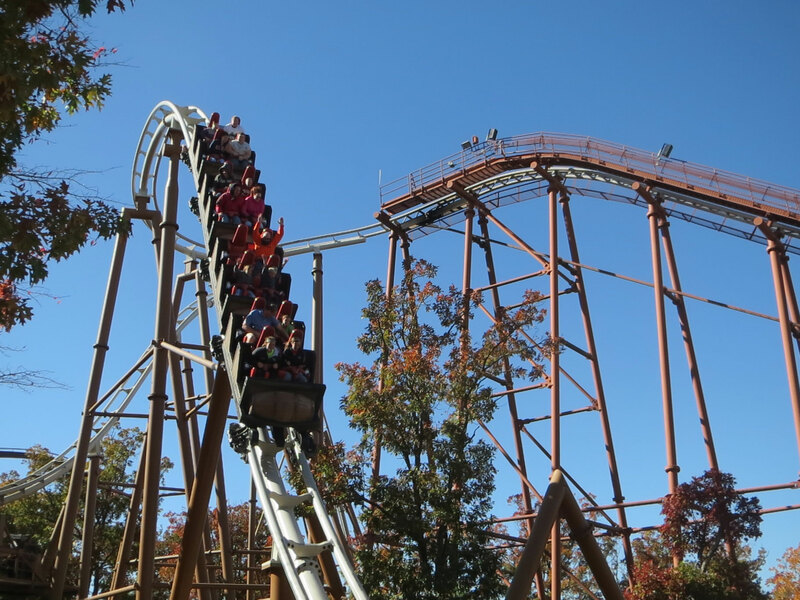 Flight of Fear at Kings Dominion in Virginia, USA. 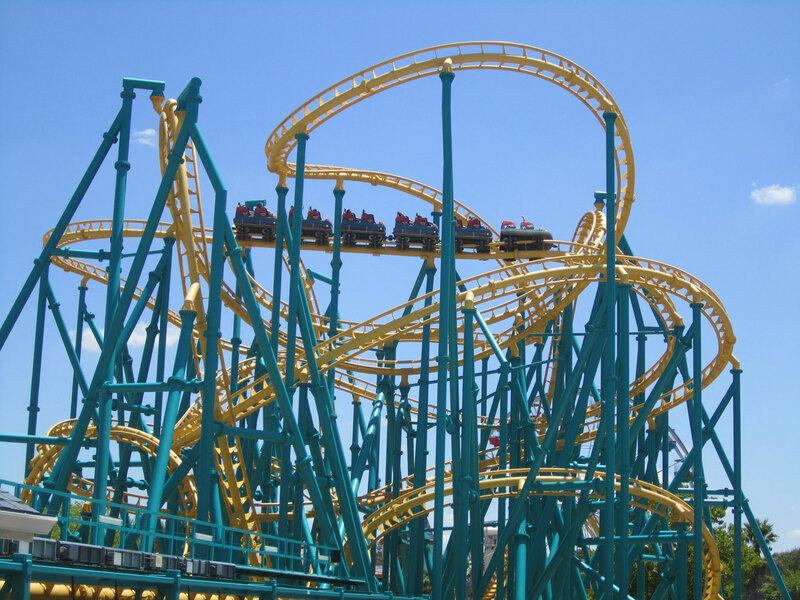 Premier Rides didn’t debut with one coaster – they started with two identical coasters. 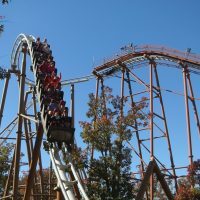 Flight of Fear at both Kings Dominion in Virginia, USA, and at Kings Island in Ohio, USA, simultaneously opened to the public on the 18th of June, 1996. When the coasters opened, they were themed to The Outer Limits sci-fi TV show and were called “The Outer Limits: Flight of Fear”. The Outer Limits name was dropped in 2001 when the license expired. 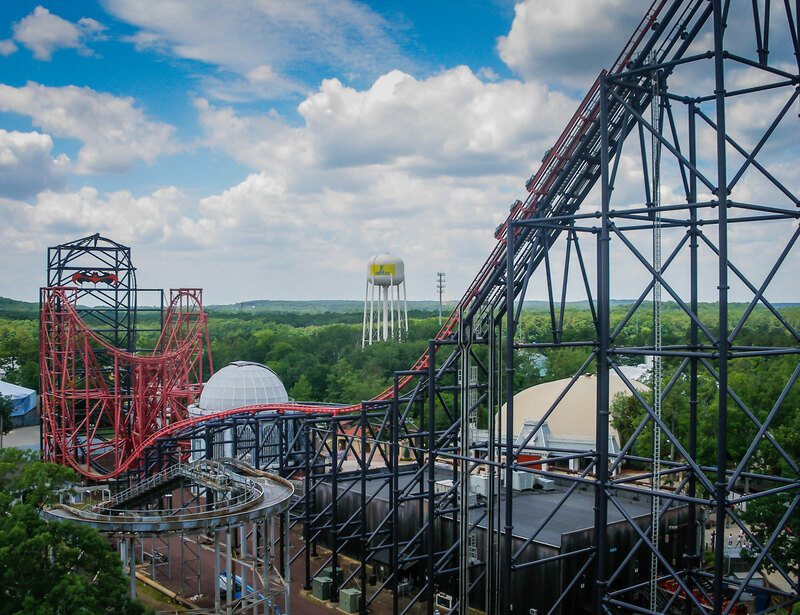 These “spaghetti bowl” coasters were the world’s first to feature a LIM launch, with the King’s Dominion version successfully completing its first test run in April 1996. The International Association of Amusement Parks and Attractions awarded Flight of Fear three awards, one for Major Theme/Amusement Park Ride/Attraction and two for Technology Applied to Amusements. 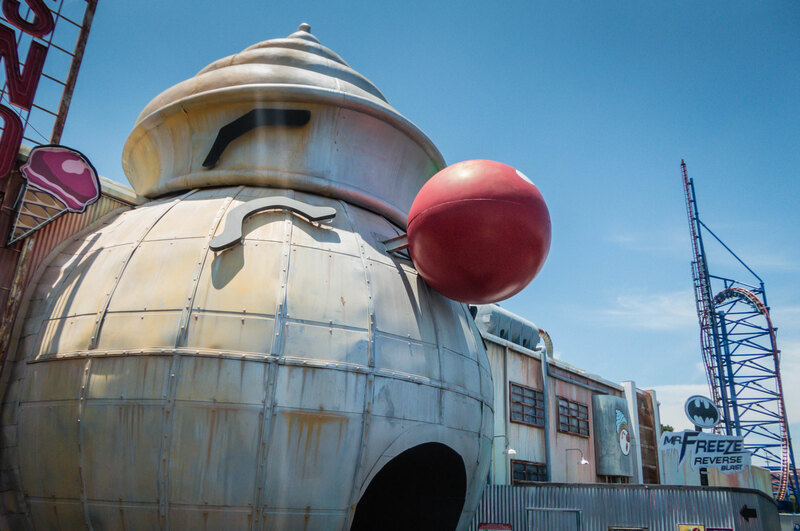 Poltergeist at Six Flags Fiesta Texas in the USA. 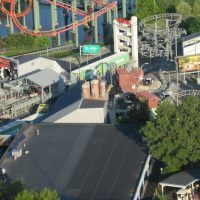 Also known as spaghetti bowl coasters, these tightly-packed looping coasters begin with an LIM launch from the station. 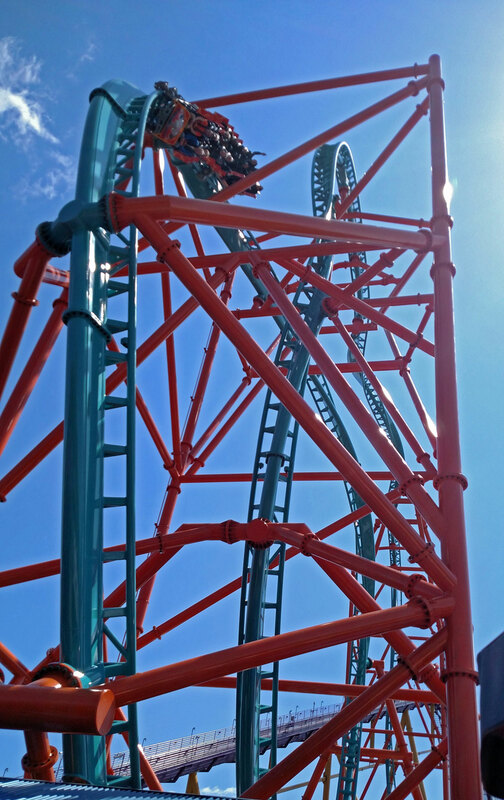 The rides feature four inversions packed into a twisted layout of turns, helixes, and hills. Most LIM Bowl trains have been retrofitted with lap bars in place of their OTSRs (over the shoulder restraints)! 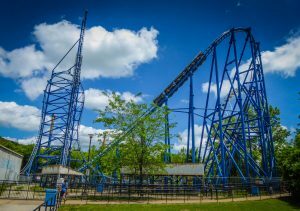 The first two were the enclosed Flight of Fear coasters we mentioned above and three years later two more opened at Six Flags America (Joker’s Jinx) near Washington DC and Six Flags Fiesta Texas (Poltergeist) in the USA. Mr. 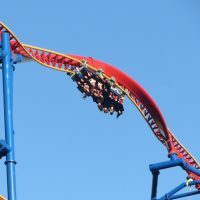 Freeze Reverse Blast at Six Flags St. Louis in Missouri, USA. 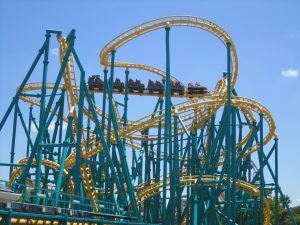 Premier LIM Shuttle Loop Coasters are famous for their incredibly intense and out-of-control ride experiences. 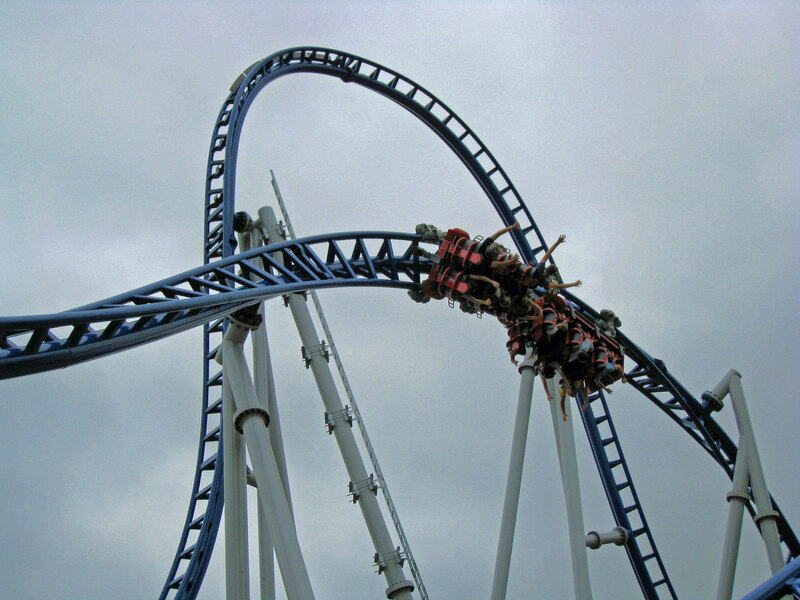 The Diving Shuttle Loop version was manufactured in 1998 and consists of a launch, inverted top hat, overbanked turn, and vertical reverse spike where the train goes up the spike and falls back down to retrace the circuit backwards. 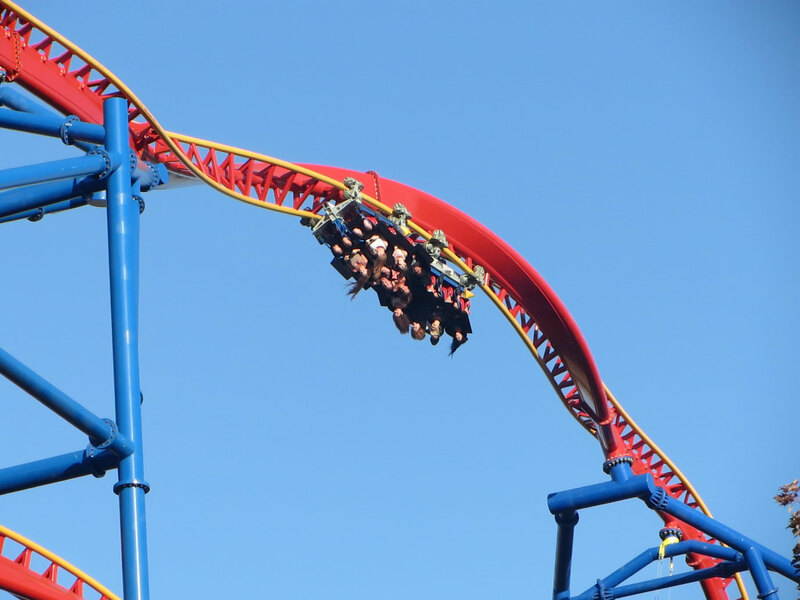 In 2012 Six Flags reversed the seating so riders face backwards and the coasters were renamed to Mr. Freeze Reverse Blast. 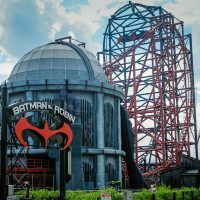 Batman & Robin: The Chiller at Six Flags Great Adventure in New Jersey, USA. 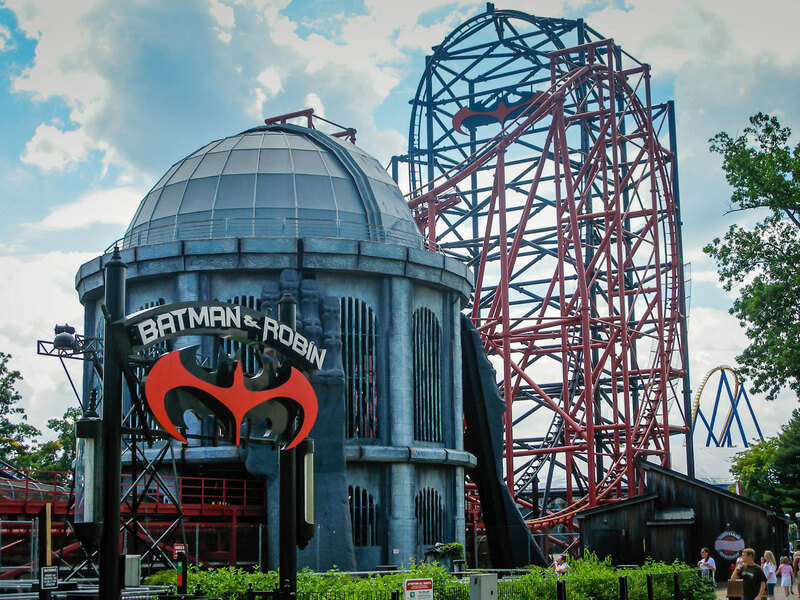 In 1998 Premier also built Batman and Robin: The Chiller, a pair of Dueling LIM Shuttle Loop Coasters featuring slightly different elements along a similar track pattern. 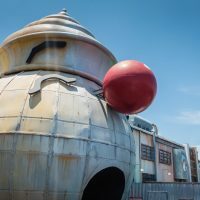 Although a park guest favorite, the coaster suffered from technical issues for years and was sold in 2008 to Beto Carrero World in Brazil, were it has sat in storage ever since. Speed – The Ride on the Las Vegas strip in Nevada, USA. 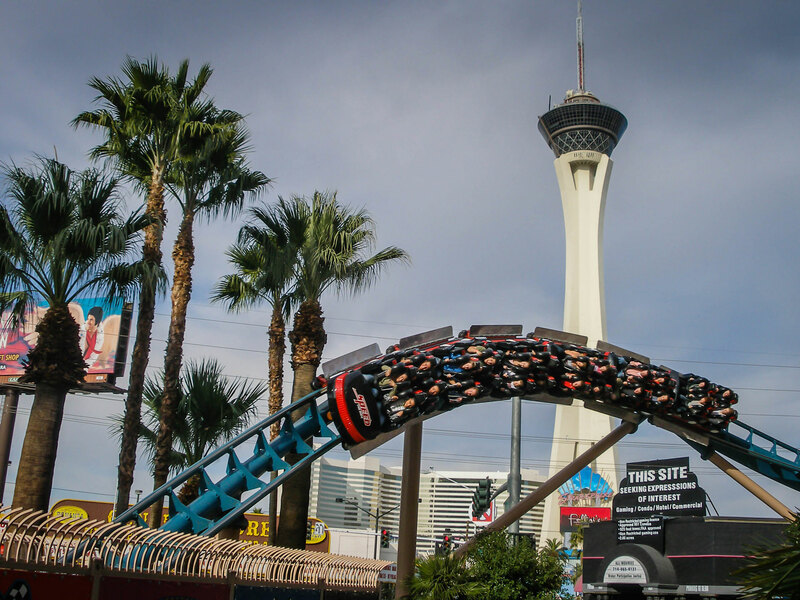 Two years after the first LIM Shuttle Loop Coasters opened, Premier built another called Speed – The Ride in Las Vegas, Nevada. It was very similar to the originals, but had a different layout without the inverted top hat. The Sahara Hotel and Casino that housed the NASCAR Café was demolished in 2011 and the disassembled coaster sits in a nearby parking lot. 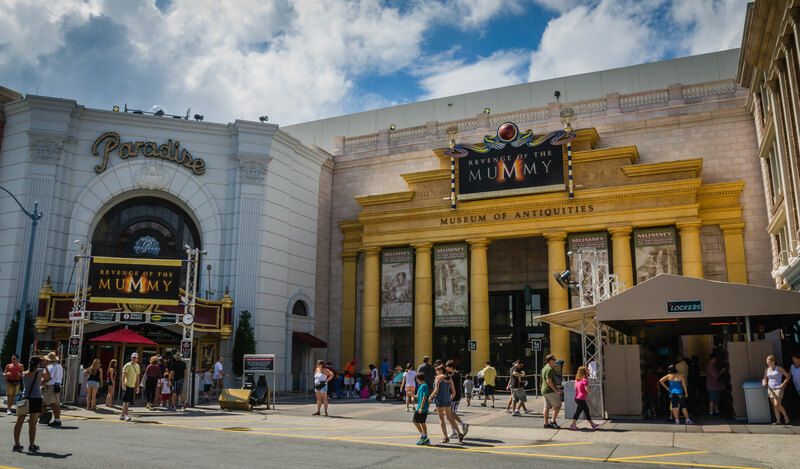 Revenge of the Mummy at Universal Studios in Florida, USA. 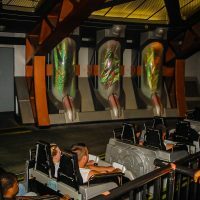 Premier’s most well known LIM launch coasters are the Revenge of the Mummy coasters at the Universal Studios parks in Florida, California and Singapore. 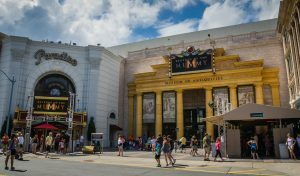 The first opened in Orlando and Hollywood in 2004, with the one in the Far East coming some six years later. 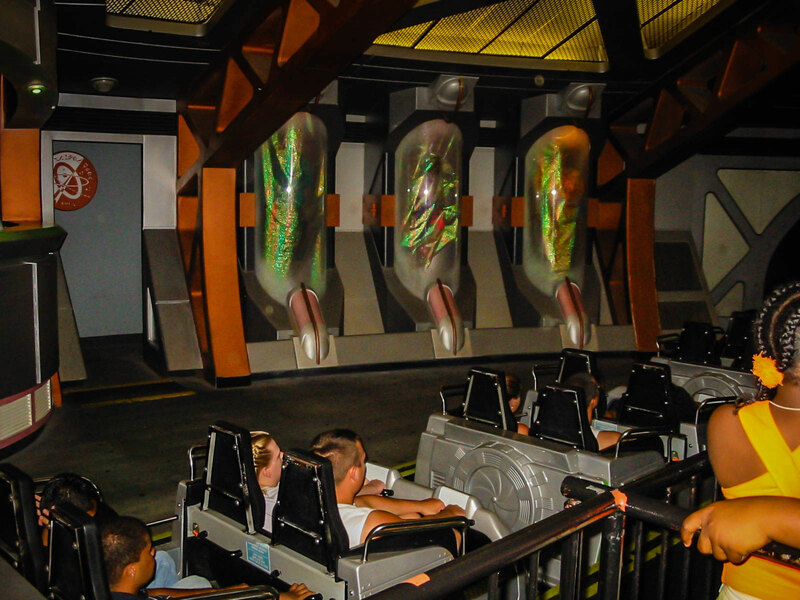 Like the original Flight of Fear LIM Bowl coasters, these three are also enclosed. 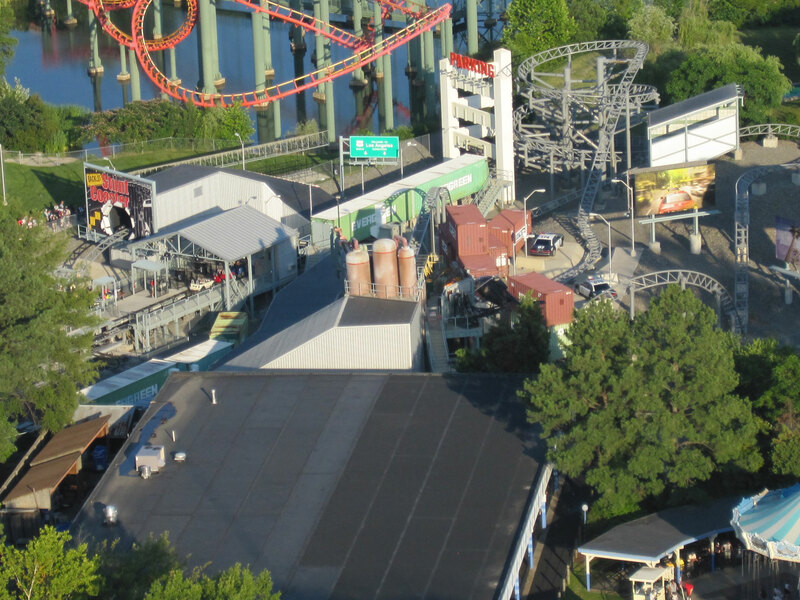 However, the coasters do not invert and feature three launches throughout the circuit, but do not have identical layouts. 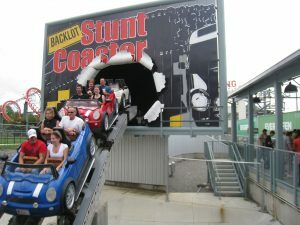 Back Lot Stunt Coaster at Kings Island in Ohio, USA. 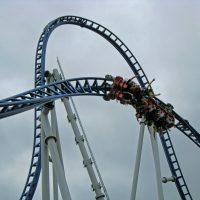 In 2005 Premier manufactured another set of triple LIM launch coasters called Italian Job: Stunt Track at Canada’s Wonderland and Kings Island in Ohio, USA. A third was added the following year at Kings Dominion in Virginia, USA, and all three had the name changed to Back Lot Stunt Coaster after Cedar Fair purchased the parks from Paramount in 2008. 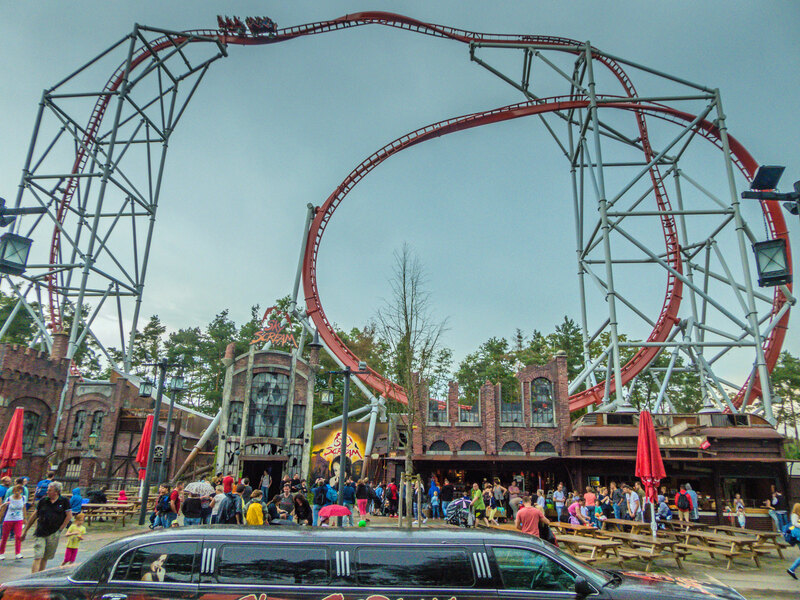 Sky Scream at Holiday Park in Germany. 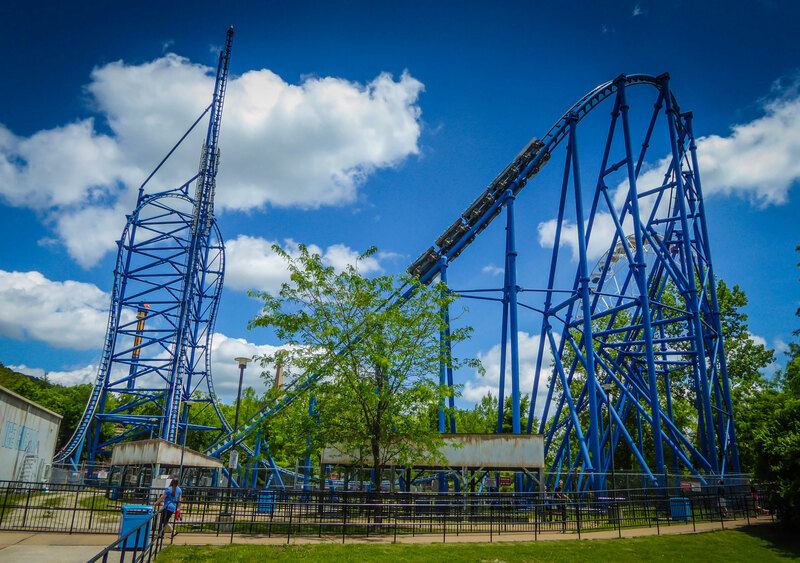 Marketed as a triple-launch coaster, the Sky Rocket II has a single LSM (Linear Synchronous Motors) launch that is used three times. The ride begins with a forward facing launch part way up the track. The train swiftly rolls backwards through the station where it receives another launch boost and climbs higher up the rear tack. 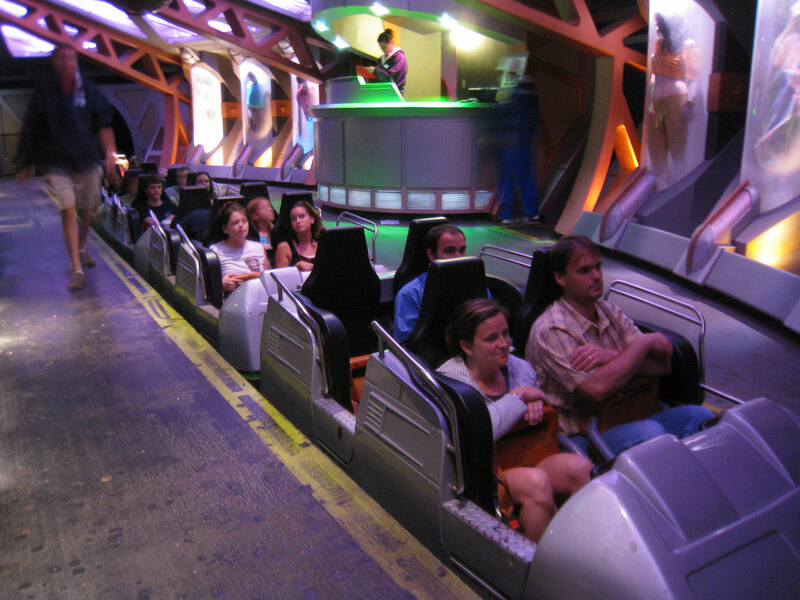 The train travels forward back through the station where one final launch occurs so the train can complete the circuit. A heartline roll inversion is at the very top, making it one of the highest inversions in the world. Full Throttle at Six Flags Magic Mountain in California, USA. 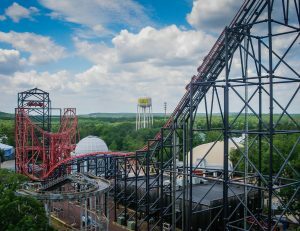 Premier also manufacturers custom LSM Launch Coasters by request from parks, like Full Throttle at Six Flags Magic Mountain in California and Sky Rocket at Kennywood in Pennsylvania (both USA). 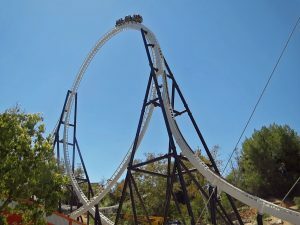 Full Throttle is the world’s fastest vertical looping coaster and features two forward launches and one backwards launch. It also has the first ever “top hat” constructed on an inversion. Although Sky Rocket only has a single launch, it features three inversions, including a rare cutback inversion, and an abundance of hang time. Vonkaputous at Linnanmäki in Finland. Premier Rides’ version of a water coaster. 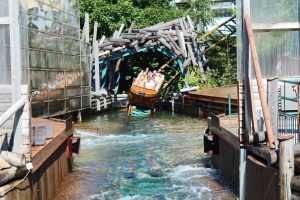 The coaster train is replaced with a boat but sits on rails as expected. The ride begins as a traditional roller coaster with a lift hill and a few turns and drops. 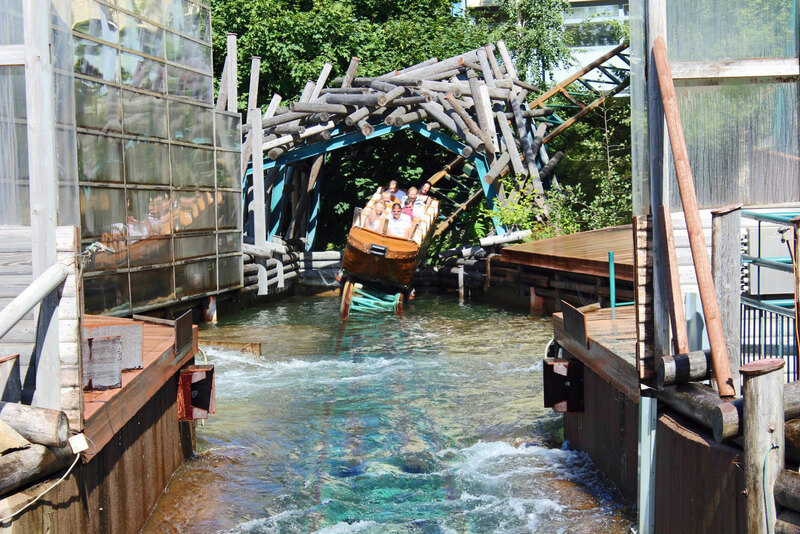 Towards the end of the ride, the boat travels down a drop and into a large water splash, soaking all of the riders on board. Premier Rides was also the broker involved with the High Roller roller coaster at the top of the Stratosphere in Las Vegas. However, the coaster was built by S&MC, the now defunct Italian manufacturer.